Looking to explore the unknown? Want to see how the untouched snow in secluded summits feels like? Well, you’re in need of good pair of backcountry snowshoes; ones with rugged construction, aggressive traction and snug fit bindings. 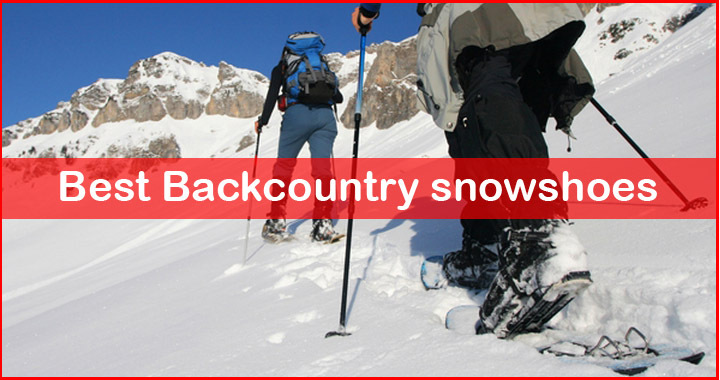 Snowshoeing through backcountry accesses have become increasingly popular for the last few years. Reasonable learning curve as well as relatively inexpensive gears are the main reasons why this winter sport are gaining more attention. Sure you still have to arm yourself with extensive winter hiking skills and knowledge, but compared to other methods of traveling i.e. skiing, snowshoeing is much easier. In this article, we’re going to talk about the top three backcountry snowshoes which are preferable by many die-hard winter explorers. If you’re not sure of what you’re looking for, check out our snowshoe buying guide. Backcountry snowshoes are different from the recreational models in a way that they come with a whole lot more technical features. More aggressive crampons, beefier heavy-duty bindings, more rugged frames and overall construction; from the tip to the tail, backcountry snowshoes are designed to be superior. 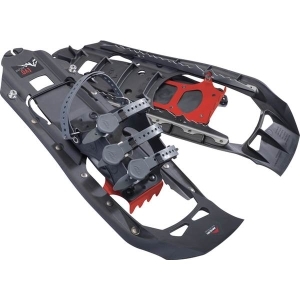 Naturally, this will result in higher price tag but compared to skis and split snowboards, backcountry snowshoes are still very much affordable. Some manufacturers like Atlas and Tubbs have tried to come up with new backcountry snowshoes like Tubbs Flex Vertical and Atlas Aspect. They offer smaller lighter frames and also more exhaustive traction systems. As much as we love the innovation, we still prefer the older models like Tubbs Mountaineer and Atlas 12 Series since they perform better in deep snow. Sure they may be bulkier but the oversized platform helps with the overall flotation. You will greatly appreciate that when you run across some real fluffy deep powder, which you will frequently deal with in backcountry terrains. For over the years, MSR Lightning Ascent have remain unchanged to be the favorite snowshoes of many dedicated winter explorers. They triumph over many other backcountry snowshoes in all departments. Flotation, traction, and security rate the highest on these snowshoes. Even more than that, they’re the also the lightest and most versatile pair. The compatibility with the 5-inch flotation tails allow them to tackle literally any types of terrain. When you’re dealing with waist deep dry powder, simply attach the add-on tails. The additional surface will help you float better above the snow. Once you’re back on packed snow, take off the tails for more agility. The only catch is these add-ons are sold separately. It doesn’t need a close inspection to figure out that MSR Lightning Ascent have the most advanced traction system. A couple of huge solid steel teeth under toes and three grippy bars of crampons beneath the decking deliver the highest traction rate on vertical inclines. Moreover, the frames themselves are integrated with side rails. They ease out the challenges when you’re making long traverses across large slopes. The bindings consist of four straps in total, which may not be too practical. But the good thing is they offer uncompromised security for your feet. They’re available in three size options: 22, 25, and 30 inches. Check out our snowshoe size chart guide to know which one is for you. What’s Hot: Good for both recreational and backcountry trips, comfortable bindings, unmatched flotation. Another pair of outstanding backcountry snowshoes is Tubbs Mountaineer. Although they don’t come with traction frames, both the instep and heel crampons are over-sized, providing superior traction on steep slopes. The good thing about their traction system is it remains comfortable to walk on trails. Commonly, with the aggressiveness of the crampons in backcountry snowshoes, you’ll notice a discomfort as you wear them to walk on groomed trails. But that’s not the case with Tubbs Mountaineer. So if you’re looking for snowshoes that perform great on all terrains, this one is your best bet. Anyway, these snowshoes are already equipped with heel lift bars too. It’s that little piece of metal that stays flat under your heel when inactive. You can flip it as an added support for your feet as you’re going through sharp ascent. It’ll help considerably reduce calf fatigue. 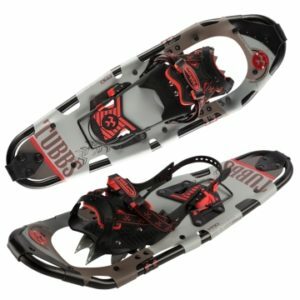 The tubular aluminum frames on Tubbs Mountaineer have a longer nose as opposed to typical backcountry snowshoes. Interestingly, this nose isn’t raised too high, enabling the snowshoes to float better on deep snow. Now naturally this would also make packing easier, but since the bindings are kind of bulky, they’re still quite a handful in tote bag. Speaking of the bindings, the strap-in mechanism on Tubbs Mountaineer is friendlier than that of MSR Lightning Ascent. It’s easier to take on and off while staying tight regardless the harsh condition on backcountry accesses. MSR Lightning Ascent may be the pinnacle of all backcountry snowshoes but they do not offer the best value for money. MSR Evo Ascent do. Even though they share similar performance with the Lightning Ascent, they are sold for more reasonable price. Now you might be curious of what makes them more affordable if the performance remains relatively the same. First off, they’re smaller, measuring in at only 22-inch. Smaller body means fewer materials, hence it’s cheaper. Furthermore, they sport a Unibody construction that eliminates the need of conventional frames, reducing manufacturing cost. There is indeed a downgrade on the traction system but that doesn’t diminish its effectiveness in gripping through slick icy slopes. You will stay sure-footed along your exploration. The 360-degree traction frames are replaced by carbon steel side rails attached underneath the decking. They act as both reinforcement and lateral crampons that come in handy when you walk through side slopes. The heel crampons are also dismissed, replaced by brake bars that are molded directly to the decks. While they don’t bite into the snow, they do provide some traction as you descend. So as you can see, nothing is really compromised on MSR Evo Ascent. The bindings are also exactly the same model given to the Lightning Ascent. The only thing that needs your attention is the flotation. Since it’s only 22-inch long, you’re going to need the add-on tails if you want to get through deep snow without too much trouble. If you’re not sure of what you look for, we’d suggest you take a look at our top rated snowshoes list.